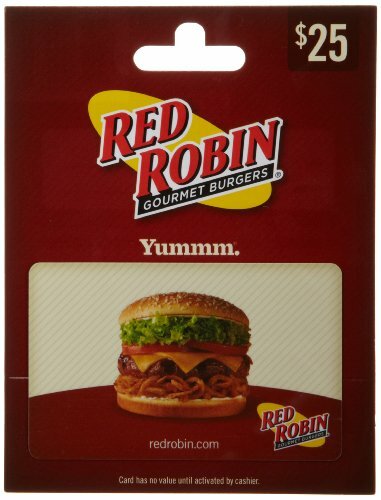 Red Robin Gourmet Burgers, Inc., is a casual dining restaurant chain specializing in over two dozen different types of delicious gourmet burgers. Red Robin also has a large selection of appetizers, side dishes, salads, desserts and its signature Mad Mixology specialty beverages. 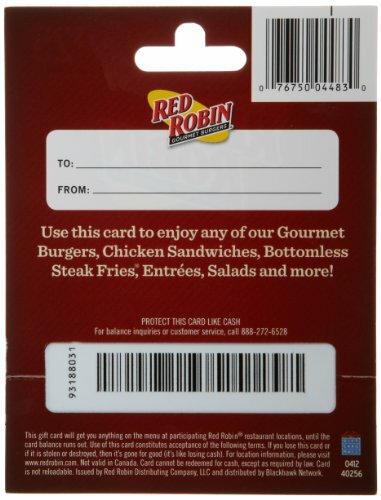 Red Robin Gift Cards are redeemable at 400+ Red Robin restaurants located across the United States including corporate-owned locations. Red Robin Gourmet Burgers, Inc., is a casual dining restaurant chain famous for serving gourmet burgers with Bottomless Steak Fries, and signature Mad Mixology Beverages. There are 460+ Red Robin restaurants located across the United States.